The Mount Hood National Forest is located 62 miles (100 km) east of the city of Portland, Oregon, and the northern Willamette River valley. The Forest extends south from the Columbia River Gorge across more than 60 miles (97 km) of forested mountains, lakes and streams to the Olallie Scenic Area, a high lake basin under the slopes of Mount Jefferson. 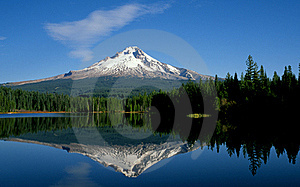 The Forest includes and is named after Mount Hood, a stratovolcano. Bonneville Lock and Dam consists of several run-of-the-river dam structures that together complete a span of the Columbia River between the U.S. states of Oregon and Washington at River Mile 146.1. The dam is located 40 miles (64 km) east of Portland, Oregon, in the Columbia River Gorge. 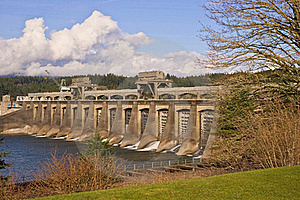 The primary functions of Bonneville Lock and Dam are electrical power generation and river navigation. The dam was built and is managed by the United States Army Corps of Engineers. Electrical power generated at Bonneville is distributed by the Bonneville Power Administration. Bonneville Lock and Dam is named for Army Capt. Benjamin Bonneville, an early explorer credited with charting much of the Oregon Trail. The Bonneville Dam Historic District was designated a National Historic Landmark District in 1987. 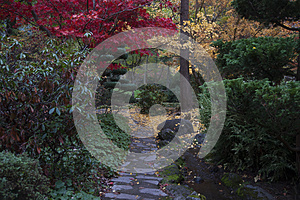 Lithia Park is the largest and most central park of Ashland, Oregon. It consists of 93 acres of forested canyonland around Ashland Creek, stretching from the downtown plaza up toward its headwaters near Mount Ashland. Its name originates from lithium oxide (Li2O) or "lithia," which is found in the stream water pumped to the park. The park has two large greens, a bandshell for public musical performances, two duck ponds, a large playground, tennis courts, community buildings and, in winter, an ice skating rink. 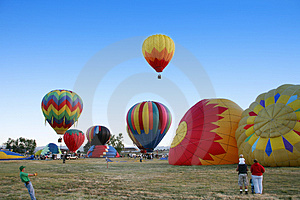 It also offers picnic areas and miles of hiking trails. 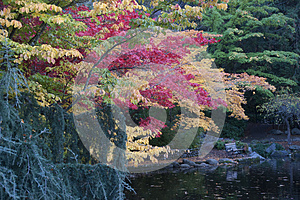 View 47 fall images of Lithia Park. Or click on image. The park was listed on the National Register of Historic Places on November 22, 1982. The area which now comprises the entrance to Lithia Park was the site of Abel Helman and Eber Emery's flour mill, the first building in what is now the city of Ashland—established in 1852. By the time the town (then called Ashland Mills) had grown up around the area, the old mill had become an eyesore, dirty with livestock and the mill all but abandoned. 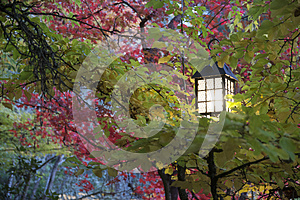 Lithia Park was named by the American Planning Association as one of 10 Great Public Spaces in America in 2014. "In 1883, a group of railroad surveyors headed by S. L. Dolson and David Loring arrived in Rock Point, near present day Gold Hill. They were charged with finding the best route through the Rogue Valley for the Oregon and California Railroad. Citizens of neighboring Jacksonville hoped that it would pass between their town and Hanley Butte, near the present day Claire Hanley Arboretum. Such a move would have all but guaranteed prosperous growth for Jacksonville, but Dolson decided instead to stake the railroad closer to Bear Creek. The response from Jacksonville was mixed, but the decision was final. By November 1883, a depot site had been chosen and a surveying team led by Charles J. Howard was hard at work platting the new town. They completed their work in early December 1883, laying out 82 blocks for development. Medford is a city in Jackson County, Oregon, United States. As of July 1, 2013, the city had a total population of 77,677 and a metropolitan area population of 208,545, making the Medford MSA the 4th largest metro area in Oregon. 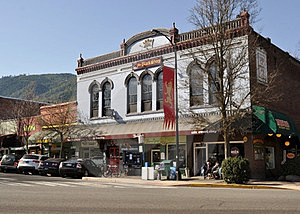 The city was named in 1883 by David Loring, civil engineer and right-of-way agent for the Oregon and California Railroad for his home town of Medford, Massachusetts, and in recognition of its supposed position on the middle ford of Bear Creek. Medford is the county seat of Jackson County.